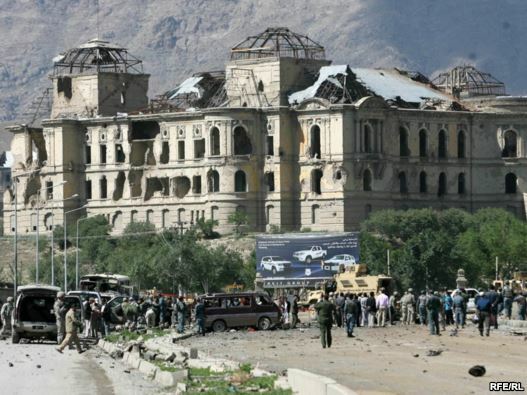 The BBC is reporting that Afghan guerrillas deployed a suicide car bomb against a NATO military convoy in west Kabul near the parliament building Tuesday morning, killing at least 19 persons and wounding 52. Five US troops are said among the dead. The enormous fireball destroyed twenty vehicles. Spokesman for the Old Taliban of Mullah Omar, Zabihullah Mujahid, phoned AP to claim that a Kabul resident belonging to his organization was responsible. NATO convoys are often targeted in the countryside with roadside bombs and suicide attacks, but such an operation in that part of Kabul against a hard rather than a soft target is unusually bold and may show increased military capacity among the militants opposed to foreign troop presence in Afghanistan. 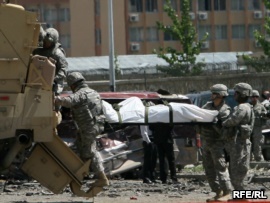 This was said to be the deadliest assault on NATO soldiers in Kabul since last September. The daring bombing comes at a time when Obama administration policy in Afghanistan and Pakistan appears to be unravelling, as detailed by Tom Engelhardt. The attack in the capital follows a number of operations in the south and east of the country by guerrillas, including the assassination of a prominent Sunni Pashtun cleric in Kunar Province who had urged reconciliation with the Karzai government and the laying down of arms, as well as a motorcycle-bombing at a prison in the southern city of Qandahar, which killed 3. Late last week a nighttime US raid in the eastern Nangarhar province that locals maintained had gone awry and killed innocents set off province-wide demonstrations demanding that the Yankees go home. This is the second time coordinated civilian protests were mounted in Nangarhar against the US military presence in recent weeks. Similar rallies were held in late April when the US killed the relative of a female member of parliament from the province. •Marine Lance Cpl. Joshua M. Davis, 19, of Perry, Iowa, died May 7 while supporting combat operations in Helmand province, Afghanistan. •Marine Lance Cpl. Christopher Rangel, 22, of San Antonio died May 6 while supporting combat operations in Helmand province. •Army Capt. Kyle A. Comfort, 27, of Jacksonville, Ala., died May 8 in Helmand province of wounds suffered when insurgents attacked his unit. •Marine Cpl. Kurt S. Shea, 21, of Frederick, Md., died May 10 while supporting combat operations in Helmand province. This incident is under investigation. •Army Spc. Jeremy L. Brown, 20, of McMinnville, Tenn., died May 9 at Contingency Outpost Zerok, Afghanistan, of wounds suffered when insurgents attacked his unit. •Two Marines died May 11 while supporting combat operations in Helmand province: Marine Cpl. Jeffery W. Johnson, 21, of Tomball, Texas; and Marine Sgt. Kenneth B. May, Jr., 26, of Kilgore, Texas. •Marine Sgt. Donald J. Lamar II, 23, of Fredericksburg, Va., died May 12 while supporting combat operations in Helmand province, Afghanistan. •Marine Sgt. Joshua D. Desforges, 23, of Ludlow, Mass., died May 12 while supporting combat operations in Helmand province. •Army Spc. Denis D. Kisseloff, 45, of Saint Charles, Mo., died May 14 at Forward Operating Base Shank, Afghanistan, of wounds suffered when insurgents attacked his unit using rocket propelled grenades and small arms fires. This despite the confident assessment often heard in Washington that Marjah was a “success” on which a Qandahar campaign could now build. Marjah is a rural set of farm houses with a population in the tens of thousands, Qandahar a city of 800,000, the size of Detroit. 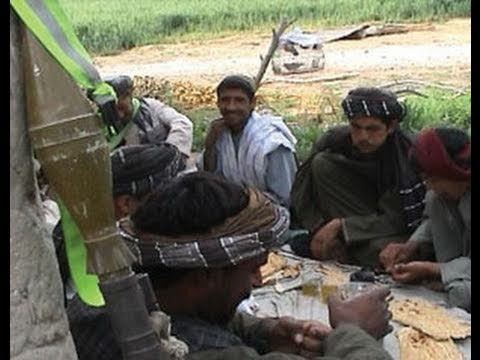 NATO commanders see the planned campaign as essential to turn the tide against the Old Taliban, even though they admit that it is a purely Afghan political force and there is “zero al-Qaeda” in the area. That such an operation may turn Afghans in the region even more firmly against the US doesn’t seem to be contemplated. For the impact of these wars on the troops, see PBS Frontline Tuesday in the US (ad to the right).